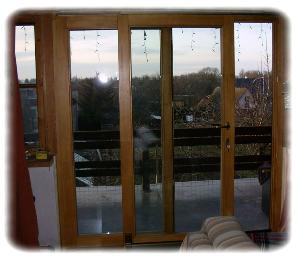 The stoppers and construction of the sliding doors allow frames with great measurements to open. Aksystem OY produces lighter type (opening frame max 1,85 x 2,4 m) and heavier type (frame max 3,0 x 2,55 m) sliding doors. Stoppers and sealings make the doors resistant to autumn rains and winter colds, which makes them useble as an outer wall. FRAME made of 3 layers of wood laminate in order to minimise wood`s natural tendency to change its volume, thus ensuring that the product is stable. The frame is 68 mm thick. JAMB made of wood laminate and sizes is 171 x 56 mm. GLASS we recommend using a 2 layer pack-glass with soft selective glass and argon filling gas, giving the pack-glass a heat-conducting value of U=1,1 W/m2 ( 6 mm selective glass + 5 mm bright glass + argon). STOPPERS we are using the production of Roto, Europe`s beading manufacturer of stoppers. FINISHING we are using ecologically clean water-based window-door paints and lazures from the German company Remmers. Painting work incorporates 4 phases, giving the doors a long life. WARRANTY we give our products a 2 year general warranty, and an additional 5 year warranty for the finishing coat, for air-tightness of the pack-glass and for the stoppers.